The Stanley Creek community, named for a gold prospector, began in the mid-1700s as one of the earliest settlements in Gaston County. Gold was mined in the area until the California Gold Rush. Among the prominent people visiting the area was André Michaux, botanist and adventurer, who discovered the tree he named Magnolia macrophylla. In 1860, the Wilmington, Charlotte & Rutherford Railroad came through the area on land owned by the Brevard family. Brevard's train depot was the primary rallying point for soldiers leaving for the Civil War and for sending supplies to troops. Around the end of the 1890s, Stanley Creek Cotton Mills was organized, beginning the textile era, which continued until 2000. Two Stanley men patented a dyeing machine, and Gaston County Dyeing Machine Company was born. 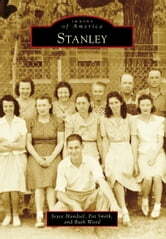 Many of Stanley's men went to fight in the nation's wars, some losing their lives. Several athletes went on to major-league baseball, and a nationally recognized sculptor lived in Stanley.